We’ve mentioned it before, one or two (hundred) times… the best way to evaluate investment performance in a vacuum isn’t by using the ‘price level’ of an index. Instead, it is best to check the relative purchasing power increase an investment has brought to the table – and you can only do that by adjusting for inflation and finding a way to include the influence of dividends. So, here’s that effort for the S&P 500’s performance through October 17, including the recent shakiness in the market. 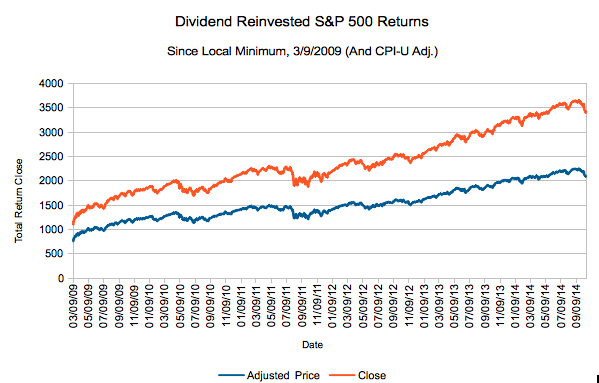 If you want to compute the returns for a different time period, use our S&P 500 Dividend Reinvested return calculator (it also does inflation). S&P 500 Total Returns from S&P Dow Jones Indices, CPI-U from BLS. As of this article, CPI-U was only available through August, so the last months are extrapolated. 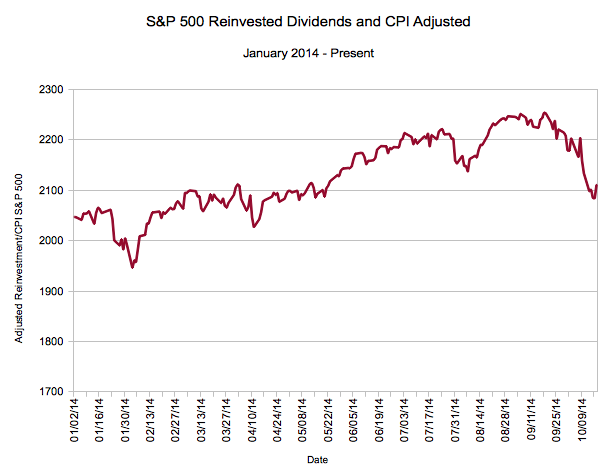 All numbers are normalized to 1/3/1994, where the S&P 500 Total Return stood at 567.095 and CPI-U’s level at 146.326. Not much to say except you’re still up on the year if you invested in January. Also, interestingly, it’s been a month or so since the ‘real’ peak by this math – 9/18/2014.